It was a thrill for me to see two guys I’ve played in several NCGA events over the years , each capture a spot in the 2010 US Open. It seems like yesterday when at age 14 Joseph Bramlett (pictured below) became the youngest qualifier for the US Amateur when he physically could not reach all the par 4’s in two shots. I was playing in the final round of the 2006 NCGA Stroke play when this yrs medalist Erick Justesen holed a flop shot from way left of the 17th green at Poppy Hills to vault him to a one stroke victory. He was a raw talent then, and an Open participant now. Joe Bramlett (a fellow Olympian) was playing his US Amateur match right in front of mine in the 2007 US Amateur at our home course the Olympic Club. We both had small leads coming down the stretch, and we both ended up losing in the first round. It was a huge disappointment as we would have played each other in the next match ensuring an Olympian would make it to round three of the amateur. I believe Joseph Bramlett will make the cut in the Open and go on to have a very successful professional career. He has all aspects of the game necessary to compete at the highest level and I wish him and Erick all the best next week. I hope to have an exclusive interview with each of these Nor Cal guys. I have already scheduled interviews with “red-hot” Ricky Barnes and Matt Bettencourt. Who’s gonna win the Open?……don’t rule out Ricky Barnes, he’s on fire and has Open experience under the gun. This Saturday I’m playing with Gareth Maybin(#122 in the world) from Northern Ireland, and Rhys Davies (#45 world ranked) Rhys Davies is also on fire after back to back 2nd place finishes on the European tour including a -10 62 last Sunday in the Wales Open (his home country). Both these guys are exempt in the US Open and could contend come Sunday. I’ll have photos and video from our Sat round at the site of the 2012 US Ope, Olympic Lake (2pm tee time). I hope you will enjoy the different style I’ll use in these spontaneous interview situations. I am not a professional interviewer or journalist, but I know a bit about golf and will be asking all these guys some things that should be insightful and out of the ordinary. Stay tuned for interviews, photos and early coverage of this years US Open. 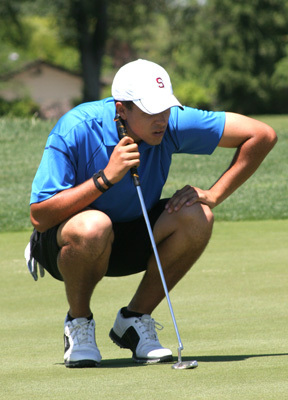 SACRAMENTO – For U.S. Open Sectional medalist Erick Justesen, the third time is the charm. The sectional was one of 13 nationally conducted by the USGA. With only 4.5% of the field advancing in Sacramento, competitors faced the stiffest odds of any of the 13 sites (the Columbus, Ohio sectional – well stocked with PGA Tour players – had 120 players competing for 15 spots). The other qualifiers included amateur Joseph Bramlett, a graduating senior at Stanford who has now fully recovered from a wrist injury that hobbled the 2005 State Amateur finalist (which was contested at Pebble Beach) the past two seasons; Kenny Kim, a professional from Cerritos who is competing on California’s professional mini-tours and amateur Andrew Putnam of University Place, Washington (after a two-hole playoff). John Ellis of San Jose was first alternate while Dillon Dougherty of La Quinta, who had holed a bunker shot for birdie to get into the four-player playoff, ended up as second alternate. Del Paso CC hosted the 36-hole event, set up at 7,121 yards, par 71, and perhaps experienced its biggest test since unveiling a comprehensive renovation in 2006. “This is the most talent we’ve had here,” said Superintendent Mark McKinney, CGCS. Greens were double cut and rolled, promoting truer and faster conditions, but light rough and even lighter wind fired up low scoring in a hurry. The opening round witnessed 35 scores at par or better (out of a field of 87). The motto of the day became go low or go home. Joel Kribel’s previous course-record 66 got lowered by a stroke by three players in the opening round alone, and then lowered again to a 7-under 64, fired by Daniel Wax of Pacific Palisades. Local favorite and former NCGA Player of the Year Spencer Levin, fresh off a red-eye flight after making the cut at Jack Nicklaus’ Memorial Tournament in Columbus, was unable to generate any momentum after opening with a double bogey, and finished at 140, three shots out of the playoff. The U.S. Open kicks off with first-round action next Thursday. John Ellis San Jose, Calif. 70-67–137 First Alt. Dillon Dougherty La Quinta, Calif. 72-65–137 Second Alt.